Spring flowers have a delicacy about them that touches one like poetry. 1904 quote in a gardening journal kept by Mary Yoder Brown Scott. The first reference to the Liberty Hall garden can be found in an 1802 letter from John to Margaretta. Around that time, Margaretta supervised the creation of a vegetable and herb garden that was enclosed by a fence. Fruit trees were also planted. The gardens and the fruit trees provided food for the household. In 1819, Margaretta wrote to Orlando that…our June apples are now in perfection… and that ...we have more cherries than usual; and currants are everywhere so plenty, that they can find neither purchasers nor consumers. As time passed, the utilitarian nature of the garden changed, and ornamental plants were added to the garden. The Browns also grew grapes from the First Vineyard in the United States. The vineyard was established on the banks of the Kentucky River (in today’s Jessamine County) by a Swiss immigrant, John James Dufour. John Brown helped Dufour pick the location and was a stockholder in this vineyard. Each stockholder received a cutting and Dufour visited Liberty Hall’s gardens in 1802 to plant the grapes. Roses have a long history in the Liberty Hall gardens as Margaretta Brown brought a Polish Rose with her when traveling from New York to her new Kentucky home. 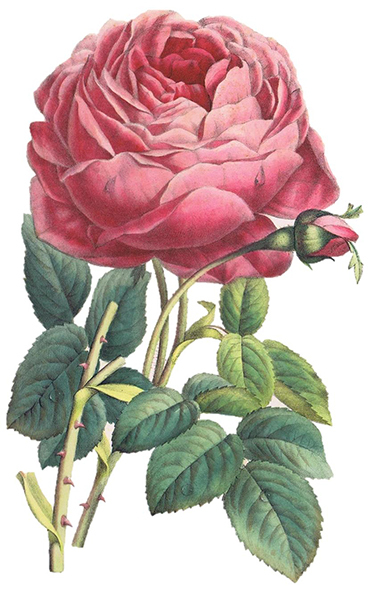 Descendants of Margaretta and John continued the tradition, as Mary Yoder Brown Scott, the granddaughter of John Brown had an extensive rose garden with several varieties mentioned in her gardening journal: Polish, Musk, Damask, Cinnamon, and Moss roses. She kept the journal from 1890-1913, which is part of the Library & Archives, and it contains information regarding many other flowering plants and remedies for unwanted insects. The family owned several gardening books as well. There are many varieties of trees on the property, including a Copper Beech, Gingko, and Holly. There are also three native Northern Catalpa trees that are important memorials for the Brown family. The oldest is a knotty tree located directly beside Liberty Hall and is thought to have been planted in 1800. Behind it stands one planted in 1900, and in 2000, Brown family descendants planted a third tree in the back yard of Liberty Hall. In the late 19th century, a twig gazebo and furniture dotted the backyard and the family enjoyed lawn tennis and celebrations in the garden. After Liberty Hall became a museum in 1937, the Garden Club of Kentucky began managing the garden. The club hired Arthur Shurcliff to design an accurate 19th century garden plan. Shurcliff had previously designed the gardens, landscape and town of Colonial Williamsburg. Mary Mason Scott, who died in 1934, and was the last resident of Liberty Hall, drew a sketch of the garden as she remembered it from childhood. The earliest layout is unknown, but the current design reflects Scott’s drawing. In 1987, the garden was restored according to a plan developed by Sarah E. Broley, a landscape designer from Washington D.C. Broley was to leave the design of the beds, but introduce plants that would have been in the garden in the early 19th century. Boxwoods were introduced in the early 20th century to the Liberty Hall gardens, and were given again in the 1960s by the Mt. Vernon Ladies’ Association. The boxwood hedges in the gardens today were planted from 1995-2000, they are replacements of the original boxwoods that were lost in severe freezes.